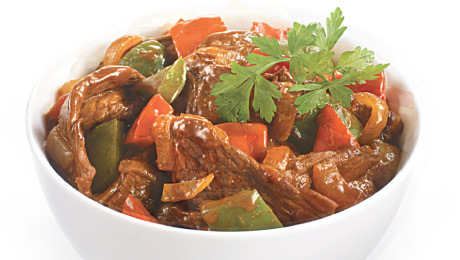 Use Erin Meal Time Sizzling Beef Stirfry mix to make this delicious dish in 5 minutes. Fry the beef strips and onions in a little oil on the hob at medium to high heat. Add the red and green peppers and stirfry for 1 minute. Add the Erin Meal Time Sizzling Beef Stirfry mix and 125ml of water. Stir well and cook for a further 1-2 minutes. Ensure the beef is cooked and piping hot before serving.